Kernos was delighted and extremely grateful recently to receive an award of £500 from proceeds of the Bures Music Festival 2016, money which has already been put towards a long-awaited refurbishment and redecoration of its consulting rooms. 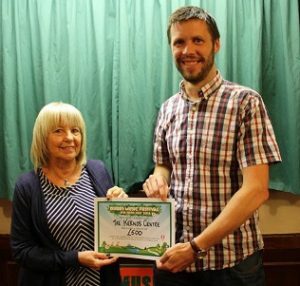 Clinical Director Chris Boatwright attended the awards evening in the Eight Bells in Bures on 6th October where Jon Perry, on behalf of the organisers, presented her with a Certificate to display in the Centre. 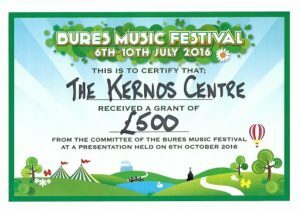 After receiving the Certificate, and thanking the organisers for their generosity, Chris reflected: “Most donations to Kernos are made specifically to fund our clients’ treatments; this award was intended to help improve both the conditions and ambience in which our counsellors work with their clients. The importance of having an agreeable and congenial environment in which to undertake our therapy sessions is often underestimated”.